Amplitude modulation uses the instantaneous amplitude of a modulating signal (voice, music, data, etc.) to directly vary the amplitude of a carrier signal. Modulation index, m, is used to describe the ratio of maximum voltage to minimum voltage in the modulated signal. If the modulating signal is equal in magnitude to the carrier, then m = 1 and the modulated signal varies from a scaled maximum of unity down to zero (see figure below). When m = 0, no modulation of the carrier is performed. If m is greater than 1, the carrier is actually cut off for some period of time, and unwanted harmonics are created at the transmitter output. The pictures here are of my restored Crosley 03CB radio, which was manufactured in 1941, before commercial FM broadcast radio was still in the experimental phase of development. 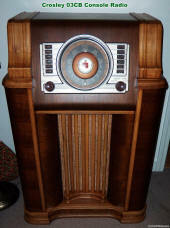 This radio tuned the 540 to 1700 kHz AM band and the 16 to 49 meter shortwave band. A 360º 25% Device is biased in to conduct in the linear region all the time. << 360º --- Two devices connected like a Class B, but biased to conduct somewhere between Class A and Class B. B 180º 78.5% Two devices in series with the output taken at the common junction. Both devices biased to conduct in the linear region for opposite half a cycle, i.e., they are never on at the same time. < 180º --- Device is biased to turn on after a certain input threshold voltage is exceeded. Very efficient, but creates distortion. D 100% Used to switch completely on or completely off. E Used for rectangular input signals. In the frequency domain, the carrier frequency is flanked on both sides by mirror image copies of the modulating signal. In the following examples, the carrier frequency is nine times the modulation frequency. Red (dashed) lines represent the modulation envelope. Blue (solid) lines represent the modulated carrier. Note: AM waveforms created with MathCAD 4.0 software.